Dave, that is what I am hoping for. Not surprising folks are saying factors are dead after 10 years into a Large Growth market. I have seen this movie before, Value was declared dead in the late 1990's and time had passed Warren Buffett by. Post 2000 was a different story, Value came roaring back and so did Buffett. So beta is outperforming the factors, hardly surprising in a Large Growth stock market, you beta believe it! Thanks for sharing, this was a fairly well balanced article in its conclusions. I think they should have done much more to do justice to the topic, but the exploration of drawdowns as expected by a 'normal' distributions vs. the stark reality was quite fascinating. An efficient frontier is a single curve created by different combinations of a set of assets. If you add an asset, then you are creating a new curve. On the other hand, one could get around that by imagining the set contains all possible assets, for which some of their allocations are set to zero. Efficient markets are distinct from the efficient frontier or efficient portfolios. If we consider TSM to consist of SV (small value), LV, SG and LG components, one could create an efficient frontier using different combinations of those assets. It would be interesting to compute what combinations were and which combinations were not on the efficient frontier over some particular time period. Can’t really disagree with anything you wrote. Whether the opportunity set of investment options is finite or not, I’m just referring to making changes to a portfolio that are likely to move it towards the northwest on return v. risk plot. In that vein, I think the argument that TSM is on the efficient frontier is something like this. 2 stocks is more efficient than 1, 3 more efficient than 2, 4 more efficient than 3, etc. By that logic, a portfolio with all the stocks in a market should be on the efficient frontier. But once we start looking at independent sources of return, where TSM might be just one asset in the portfolio, we can start moving potential portfolio efficiency up and to the left on the plot. The end date on the chart is a bit suspicious. Adding commodities really changes a portfolio that much? I don't think factors add the same way as the assets in the charts. Adding factors subtracts assets from a portfolio, as opposed to adding them. The specific asset classes in the portfolio are irrelevant. The point is that combining multiple less than perfectly correlated, uncorrelated, negatively correlated sources of return increase the likelihood that a given portfolio will land closer to the upper left. What an investment potentially adds to a portfolio depends on expected return, volatility, correlations. The Roger Gibson diagram ends at 2009. Since then, collateralized commodities funds (CCF) have diversified returns by not recovering from their significant losses in the 2008 Crash. If the Gibson chart was updated, the ABCD position (implying 4 by 25% allocation) would be in a noticeably different position. Look at the end values on the diagram, it shows commodities with an average annual return of 8 %! That might be a negative 8% by now. My problem with exotic factor exposure is how the factor components have changed over time. PIMCO's commodities fund was the way to go in the 2000s decade, but now it is AQR funds that are focused on entirely different factor exposures than the PIMCO fund was. I'm not against new knowledge, but switching to entirely different factors after the previous ones failed while still labeling it "factor exposure" is not an apples to apples comparison. Secondly, the above is striving for more returns from the same investment amount, when just saving more is another effective path to a larger portfolio value. Shouldn't we just accept what we get, instead of constantly trying to boost our rates of return? I don’t think that is necessarily true. I can think of investments that could move a portfolio towards the upper right or lower left or lower right. Your last sentence speaks to that. And if my portfolio consists of LV, SV, LG and SG, will that end up above and to the left of SV by itself? I would say that it could, but it would depend upon the strength of the factor loads on each fund and what negative alpha each has. If you have a SV fund like the generic Vanguard Small Cap Value Index Fund Admiral Shares (VSIAX), there isn't a large hurdle to cross since it doesn't have very strong value or small cap loads to it. That way, if you have a LG fund with strong momentum and quality loads, then you could likely outperform VSIAX. Similar with SG and LV. It's highly dependent upon how the funds are constructed. I think that’s the wrong question. I think the better question is “if I create a portfolio with LV, SV, LG, SG, where will that end up compared to SV + Bonds titrated so that both portfolios have same expected return”. My guess is that it will be very time dependent. But on average I would bet the SV+Bonds portfolio is more efficient. It includes exposure to term and credit premia which should yield substantial diversification benefits. I think this makes sense. And I think it might make sense to view a portfolio that is tilted to load on different factors as a way to move your portfolio into one with better returns and/or lower volatility. I do see what you are trying to do with factor investing, and agree that it very well might work as intended. Where I draw the line though is taking the potential benefits of a factor portfolio as a given, and then claiming such a portfolio is better diversified. I strongly believe that such a claim is kool-aid served by those who are promoting the concept out of their self interest, or are adopting the view to try and calm their self doubts. I'm not sure what Larry wrote in his book in regards to the correlations between factors not being stable, converging at the worst possible times, not being normally distributed, and having momentum (meaning bad returns predicts more of the same), so perhaps I am overly harsh in my assessment. Honestly, I just want to get a realistic view of what we are looking at. I agree. And I think it's worth looking at and considering especially since the shifting correlations, skewed and fat-tailed distribution of factor returns. We report estimates of how frequently we should expect losses of this magnitude if we were to assume that returns are normally distributed. Of the dozen extreme observations, 10 should have occurred less frequently than at least once during the length of the recorded history of mankind, 6 should have occurred less frequently than the length of the period biologically modern humans have roamed the earth, and 3 should have occurred less frequently than since our universe was created as the result of the Big Bang about 13.8 billion years ago. Wow. That was for returns recorded in the last 55 years. (one flip side was that value recovered faster than expected too). So while I agree with Random Walker that factor investing may have some real benefits, I think it also could have a negative effect particularly in any particular holding period. I strongly disagree with statements calling factor tilted portfolios as being better diversified because such a view assumes that returns from your factors will be a net positive in your holding period. It may or it may not. Simply stated, I don't believe that concentrating your portfolio into stocks that load on various risk factors which have in backtesting (including periods when these factors were not targeted by large amounts institutional money) outperformed, should be called anything other than taking additional risk. I personally think it's a risk worth taking, but also realize that the past few years where both value and momentum underperformed is probably well within the normal variability we can expect in factor returns. So instead of asking if value or other factors are broken, perhaps the more relevant question is what expected returns look like and if they fit into our investment horizon. For now, I think perhaps they do, but won't be surprise if perhaps they don't. So, just adding partially correlated assets does not necessarily improve efficiency. And factor investing increases risk with the expectation of increasing return. Factor investing should increase portfolio efficiency: either increase return and increase Sharpe ratio, or if comcomitantly increase bond exposure keep return about same and also increase Sharpe ratio. Why? I see nothing in the theory that that must be true. It’s all about how portfolio components mix: expected returns, volatilities, correlations, when correlations tend to change, and of course, costs matter a lot too. It is not clear that factor investing doesn’t just move along the efficient frontier. To me it seems that not enough about factor returns, volatilities, correlations, and correlation stability is known to be certain that portfolio efficiency will be increased in any given holding period. In other words, even with ideal factor diversification and zero cost, you are still adding the risk that the stars misalign in your investment horizon. The observed returns of factor investing shows how their non-normal return distribution and momentum means that is true. You might get increased portfolio efficiency, and you might hold during a period where you don't. I think it's misrepresenting the risks of factor investing to say its benefits are guaranteed, and I think that misrepresentation occurs often on this site. Even if increased portfolio efficiency is a sure thing, it is not a sure thing to you for your portfolio in your investment horizon. And thus it is a less diversified portfolio. It’s hard to see how: they are called “risk factors” after all. I mean, it’s right there in the name. If there is more than one risk factor then there must, by definition, be more than one efficient frontier. We see things very differently! Certainly holding period can influence everything. That being said, you talk about stars aligning. Doesn’t it require substantial star alignment for the single factor, market beta, to work out over a single defined period of time? Diversifying across factors can decrease the likelihood of seeing negative returns over any single time period; in fact, the shorter the look horizon the more important factor diversification could be. All factors, including market beta, can do poorly over any time period. Nothing is guaranteed, including market beta. 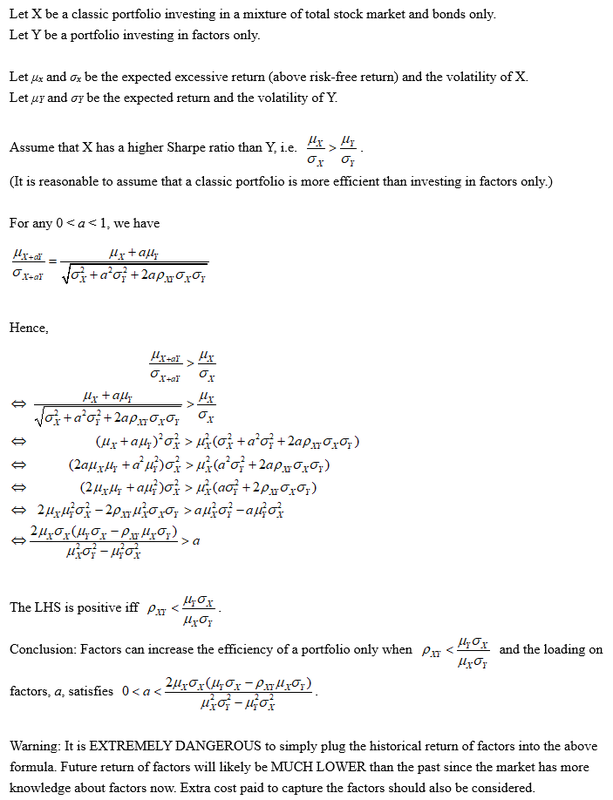 Take a look at the charts in chapter 9 of Larry’s factor book. The 1/n portfolios are substantial evidence in support of factor diversification. Granted, it’s all based on historical data, but for that matter, so is the market factor. ..., you talk about stars aligning. Doesn’t it require substantial star alignment for the single factor, market beta, to work out over a single defined period of time? Diversifying across factors can decrease the likelihood of seeing negative returns over any single time period; in fact, the shorter the look horizon the more important factor diversification could be. All factors, including market beta, can do poorly over any time period. Nothing is guaranteed, including market beta. Take a look at the charts in chapter 9 of Larry’s factor book. The 1/n portfolios are substantial evidence in support of factor diversification. Granted, it’s all based on historical data, but for that matter, so is the market factor. Dave: You're talking as if factors are something real. They aren't. They are simply measuring covariances of one asset to another asset. They are useful tools for assessing where the risks lie in your portfolio, but you don't invest in a factor any more than you would ask, "How much does 6 inches cost?" "Market beta" is investing in stocks collectively. Companies earn money and they distribute some of those profits to shareholders. Returns are driven by the basic nature of capitalism. This doesn't mean that equity investors are guaranteed to make money--the market could reduce the valuation that it puts on those assets after all. Now let's take, say, the momentum factor. It's taking a hypothetical cost-free portfolio of going long high momentum companies and going short low-momentum companies. Profits are made by the market undervaluing the high momentum companies at the outset but ultimately realizing their true value. If this is indeed what happens, you make money; if the reverse happens (high momentum companies are overpriced), you lose money. Profits [or losses] here are generated from market mispricing. The mechanisms that underlie various factors are different. I personally prefer to focus my investing on "factors" that have an underlying economic reason to exist and leave taking advantage of market mis-pricing to the domain of little bets on the side. We see things very differently! Certainly holding period can influence everything. That being said, you talk about stars aligning. Doesn’t it require substantial star alignment for the single factor, market beta, to work out over a single defined period of time? No. I don't think so. Not as much as when you concentrate your holdings in particular factors (such as value, size, momentum etc). When you hold the market, you hold value and it's opposite, size and it's opposite and momentum and it's opposite (thus giving you your "no net exposure"). So if those factors do well, you benefit from the portion of your holdings that load on those factors. And if those factors do poorly, you benefit from holding those stocks that do not load on those factors. This is the nature of market returns. Granted by tilting to those factors, which have a history of outperformance, you may be able to have your more efficient portfolio (higher returns for the same volatility or the same returns for lower volatility). That is only if your holding period corresponds to one of the periods of those factors' outperformance though. Diversifying across factors can decrease the likelihood of seeing negative returns over any single time period; in fact, the shorter the look horizon the more important factor diversification could be. All factors, including market beta, can do poorly over any time period. Nothing is guaranteed, including market beta. Take a look at the charts in chapter 9 of Larry’s factor book. The 1/n portfolios are substantial evidence in support of factor diversification. Granted, it’s all based on historical data, but for that matter, so is the market factor. There is a longer history of people investing in the market factor than there is in people investing in more recently discovered factors (value, momentum etc.). We don't have much historical data where institutional money has poured into those factors. Much of whatever evidence is cited in Larry's book is surely from when these factors were not being pursued. I don't think you can say that about market returns. So whereas you assume concentrating your portfolio into these various risk factors will help ensure smoother results, I assert that is not necessarily the case. So again, I interpret what you are saying is that while value may have a decade long drought, that it's likely the other factors you have tilted to will offset the poor results of value. Actually though, that doesn't seem to be necessarily true and given the short history of data we have on actual factor investing combined with it's very non-normal return distribution, I don't believe it's true to say that concentrating in risk factors will improve your chances of doing better in any give time period relative to returns from holding the market. If return is a function of risk, then for each value of risk there can only be one return that is the highest. If there is more than one risk factor, you can no longer conceptual risk/return in two dimensions. If there are n sources of risk there are n risk/return efficient frontiers in n+1 dimensions. Risks can be lumped together into an overall risk, especially if one is just using variance of returns as the measure of risk. Nope. Not the way works. I can give you some sources to read if you want (or search Google for “Cochrane multifactor world”), but conceptually it’s important to be consistent. If the variance is the only source of risk then there is only one efficient frontier. If there are additional sources of risk, the MUST be additional efficient frontiers. One powerful allure of CAPM is that it simplifies the world into two dimensions, making it easy to visualize. Unfortunately it’s not a particularly accurate model of how the world prices assets. IMO market pricing based factors (like value & momentum) are different than fundamental/economics based factors (like term, credit spread, re-insurance & market beta). The former are dependent upon the market pricing the securities that have exposure to the factors versus the later which depend upon the market arbitraging the difference based upon economics. IMO market pricing factors can fade when there are a large number of folks purchasing them as the fundamental/economics reason for their existence gets arbed away. Value is an example of in an inefficient market is a fundamental factor but in an efficient market factor becomes a pricing based factor. IMO much of the discussion of the diversification of market priced based factors is the marketing of these factors as fundamental when they are not. Expectations are set that sometime the fundamentals will correct the under performance of price based factors. I think this is incorrect. The priced based factors are as nisiprius has quoted Fama as saying they more like preferences than return driving fundamentals. If they are preferences, then price based factor investors are chasing their collective tales as there is no fundamental to revert to. If we focus on the fundamental/economics based factors, then Bogleheads have included the major ones at low cost in their portfolios. There are some interesting minor ones that can provide some additional diversification/return benefits if invested in at a low enough cost. Re-insurance is an interesting one that is fundamental but has gone through a period of increasing efficiency. Potential providers of capital to re-insurers can provide it in a matter of weeks versus years in the past. This has led to decline on the premium insurers could obtain in the past & thus lower returns. I think it is dangerous to rely on risk premium data from a period when the market was much less efficient. This IMO is the rationale for investing in a product such as SRRIX. This history also allows SRRIX to charge high fees & some can justify this based upon the high historic premium. If on the other hand you wanted exposure here, you could invest in re-insurers that hold primarily bond portfolios & thus you exposure would be bonds + re-insurance. The other aspect here is you can invest in insurers/re-insurers that are price sensitive & will vary the size of their book based upon pricing versus capital available. Some examples here are WR Berkley & Lancashire Re. Other areas include bond like investments (first lien claims) on assets that are generating good cash flow whose owners want to obtain higher returns via leverage but does not have a readily bankable asset. These include areas like NNN leases & specialty lending. This area requires strict underwriting as this provides the margin of safety. Some examples include STORE Capital, Broadstone Net Lease & TPG Specialty Lending. Another related area is leasing. This is in line with the current trend of asset sharing & the associated economics. If underwritten correctly & you have a large & growing market, these cash flows are bond-like. However, the risks of utilization have to be managed which make then more risky than the NNN or specialty lending but on a diversified basis these cash flows can provide a loosely correlated asset. Some examples include United Rentals, Ashtead, Ocean Yield & Airlease. Still another area is micro credit, small loans given to individuals/businesses on a diversified basis. This is one area IMO there may be some competitive alternative products, LENDX being one. However, here again fees are high & the structures have not been tested in a credit distressed environment. Some players with more tested models include Capital One & Discover in credit cards. One observation with these alt investments is that there are publicly traded firms that can provide similar & professionally managed exposure for much lower fees than what the alt funds charge. 1. What were your takeaways from this paper. Seems like there are severe data-mining problems and the micro-cap effect is huge. 2. I work on algorithmic trading, bcs of this I have a bias against the research on factors (methodological reasons, market adaptation reasons). I However, I also have real exposure to alpha generation and also an intellectual bias to give a chance to the low vol anomaly and the momentum (cross sectional) anomaly. I see these two as 'above' and more 'dynamic' sources of persistent alpha. Do you share this view? 3. As a way of example, how would you critique from the stand point of diversification of risk factors, a portfolio (us stocks only) that replaces VTI, with equal parts MTUM, USMV, IJS? Edit: Here are some summary slides from the "Replicating Anomalies" paper. It's been a while since I read that paper, but my sense is that it's a pretty well-designed approach. It seems to me that most of the common risk factors received some replication support, but I definitely agree that data-mining and publication bias have been big issue in this field. I don't think Fama-French get enough credit for their methodological advances which, if more researchers used, would alleviate this problem to some extent. I'm not as well-versed on momentum (possibly picked up a personal bias from Fama on this one), and cross-sectional momentum has always struck me as pretty difficult to capture cost-efficiently. My experience has been that screening momentum and value separately (as you'd effectively be doing by holding both MTUM and IJS) is difficult, since they tend to be negatively correlated. MTUM usually has a negative loading on value, for instance, which counters the benefit of owning IJS at least in part. USMV has a negative loading on size. Both IJS and MTUM have a negative loading on low volatility. It's going to be very difficult to get significance for low vol, momentum, size, AND value all in a single long-only portfolio. I'd probably be much more tempted to find a single multi factor fund like Vanguard U.S. Multifactor ETF (VFMF). You give up some of the low volatility exposure, but end up with much stronger factor loads for the rest. I'd definitely consider using Vanguard US Momentum Factor ETF	(VFMO) instead of MTUM. VFMO helps preserve the small tilt from IJS and has less negative load on value than MTUM. Another finding is that the value-growth factor is less powerful than most ppl assume. My experience has been that screening momentum and value separately (as you'd effectively be doing by holding both MTUM and IJS) is difficult, since they tend to be negatively correlated. What I was thinking naively is that Low Vol and Momentum, will screen for stocks that traditionally are considered in the value-growth or quality spectrum just by virtue of exhibiting whatever filter they use. For instance, at some point value stocks will do well and will have good 12 month performance to satisfy inclusion in a momentum screen. Same with low volatility. Right now, large growth is doing well, that's why MTUM is full of that, at some point that will change, I'm assuming MTUM composition will change as well (i believe they re-balance 2/year to keep cost down). MTUM can't/doesn't include small caps, for capacity reasons. So this would be a blindspot. MTUM usually has a negative loading on value, for instance, which counters the benefit of owning IJS at least in part. USMV has a negative loading on size. Both IJS and MTUM have a negative loading on low volatility. The "counters of benefit" that you mention here, does this express itself in a cancelling out effect where your portfolio as whole behaves more like the market (except you are paying higher fees)? This is interesting given that size itself it's not a powerful factor (Andrew Ang in his book mentions that the effect is almost irrelevant today) so why do you think is important to have a "balance" of size of the portfolio instead of letting the power of the factors orient the size tilt itself? Are you saying all risk factors have constant, known risk? All I meant was that it strikes me as implausible that most people are “ignoring” the riskiness of something called “risk factors”. It’s a little like eating something called “death fruit” and then claiming you didn’t know it could kill you. Yes, that’s it. The danger in using two uncoordinated managers is that they will create a net effect of zero. I think it makes more sense to use a single multifactor fund, or at least choose single factor funds that explicitly screen out negative loads on factors that you want. I thing Ang is wrong, mostly. Meta analysis of studies show the size premium is persistent, albeit perhaps smaller than it was pre-1981, especially when combined with quality and value. I’m open to the notion that size might itself be a multifactor risk proxy, possibly reflecting the intersection of a liquidity risk factor and the value risk factor. Vanguard has suggested this, and it seems plausible to me. I know that some people argue that size alone is not relevant. But to me intuitively its a risk. More importantly, I think the other factor premia are more pronounced in small stocks. E.g value and momentum more pronounced in small. I would tend to agree with you about the small cap premium. That would also explain the problem with junk small growth stocks. I see nothing in the referenced paper that says that one cannot combine return variance, with something like a "recession factor", to create an overall measure of risk. And, even if one wanted to move to an n-dimensional risk vector, then the efficient frontier would just become a single n-dimensional surface. And for each n-tuple of risk, there is only one return that is highest. BTW, changing terminology mid-stream can be confusing. Are size, value, momentum, quality, etc., factors or sources of risk? Is variance a source of risk or a measure of risk? Is the "recession factor" in the paper a factor or a source of risk or a measure of risk? And, even if one wanted to move to an n-dimensional risk vector, then the efficient frontier would just become a single n-dimensional surface. I don't think you fully grasped the content of that paper. You understand that this n-dimensional surface has n tangency points, right? And that those tangency points represent mutually exclusive portfolios? There is no long AN efficient frontier. BTW, changing terminology mid-stream can be confusing. Are size, value, momentum, quality, etc., factors or sources of risk? There is no change in terminology. Risk factors represent sources of risk and sources of return. They are one and the same thing. The n-dimensional surface is the efficient frontier. Tangency points are points on the efficient frontier. You might need to read the paper again. If the variance is the only source of risk then there is only one efficient frontier. So, variance is on par with size, value, momentum, etc? As is the recession factor? There are several passages in the books "Complexity: A Guided Tour" and "Scale: The Universal Laws of Growth" that would support your statements. Both books exist outside the field of investing, but are germane to any complex system, such as investing. I recommend anyone interested in factor investing read them both before doing so. Or maybe things can be viewed mathematically? Personally I will give a yellow light instead of green light nor red light towards factor investing. Factor investing can improve a portfolio only when (1) it can still generate alpha in the future, (2) it has low enough correlation with stocks and bonds and, (3) the exposure to factors has to be small enough. I think risk-based factors may still generate alpha in the future, but I suspect that they tend to have a positive correlation with the market beta. Behavioral factors could have very low correlation with the market beta, but their alpha could be arbitraged away in the future. The calculation above showed that if factors has n% as much risk-adjusted return of an original portfolio, then its correlation with that portfolio cannot exceed n% or it will actually hurt your portfolio. Finally, if this condition can be satisfied, a very small exposure to factors may have a better odds of improving the efficiency of a portfolio, but the effect would be so small that we have to consider if it is worth to sacrifice the simplicity of the portfolio. My issue is the line of thinking that is sometimes extolled that goes like this. Small-cap value is exposed to both size and value and because they are uncorrelated factors this is a diversification that leads to small-cap value being less risky than either an all-cap value portfolio or a small-cap blend portfolio (portfolios that are exposed to either one of the factors but not both). But despite the lower risk, small-cap value has a higher expected return by virtue of being exposed to both risk factors, and moreover, the value effect is more pronounced for small caps so the expected return is further enhanced despite the lower risk from diversifying across both factors. I think the above is contrary to the widely held position that reliably diversifiable risks are not compensated, so I don’t buy the diversification across factors argument. The article cited by the OP was dispelling the position in the previous paragraph, and that is summarized in the first bullet point of the article, that I quoted back. Factors may be positively correlated, uncorrelated, or negatively correlated in an investment outcome. When they are positively correlated, multiple risk factors may contribute simultaneously to a negative outcome. This is the point the authors were making. The Fama French work demonstrated that size and value are unique and independent factors from each other and from market beta. These unique independent risks cannot be diversified away. I think size is probably positively correlated to market beta, both intuitively and from backtest result. Value may be more debatable. From what I remember size to market about 0.4, value to market 0.1, size to value 0.1. Which would imply that there is no risk mitigation by diversifying across size, value, and beta. Well, growth has been on a tear recently, so it doesn't seem bad timing to start a value tilt. What is waiting going to do? Is it that you'll feel more comfortable once value starts having better returns? Anyway, just how bent out of shape are you going to be if VFMF underperforms for the next 10-15 year? Not so difficult right. But what if their momentum implimentation needs tweaks along the way? Another thing to ask is what makes you different than the average investor? If you load up on risk factors, really you are undertaking holdings that someone doesn't want to have. If factor investing were easy and sure to have better returns, wouldn't everyone do it? I don't think substituting VFMF is crazy, but it's possible the risks of poor factor returns converge in your holding period. If you are ok with that, then I don't have a real argument of why you shouldn't do it. But at 559 stocks, and with the 10 largest holdings equalling 10.80% of total net assets, it doesn't seem to concentrated. In the end though, my biggest worry would be momentum. It doesn't seem easy to do. AQR should be good at it, but I don't think their momentum funds have great returns. Total Stock is core to your portfolio and what if money flowing into the space of value, momentum and quality stocks affects things such that the plans based on backtesting don't have the same results going forward. Maybe the factors do provide returns, but maybe your fund isn't capturing them due to their construction. Last edited by typical.investor on Mon Dec 10, 2018 7:14 am, edited 1 time in total. What is your reasoning behind making the switch? Do you need to take more risk to reach your financial goals? Would your retirement be significantly affected if the risk shows up and VFMF substantially under-performs Total Stock Market?